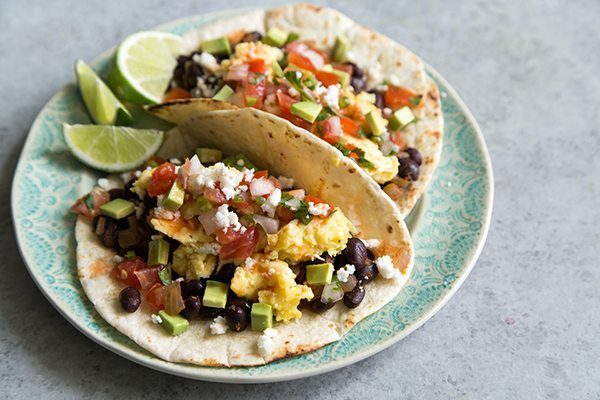 These Breakfast Tacos are filled with seasoned black beans, soft scrambled eggs, and topped with fresh salsa and queso fresco. We’ve all been told that breakfast is the most important meal of the day. If that’s the case, I say eat your favorite foods first thing in the morning! For me, that’s tacos. Tacos are my love language and I can eat them all day long. For one thing, tacos are super versatile. From breakfast tacos to dessert tacos, tacos can be filled with anything you want: braised beef, shredded chicken, and even ice cream!